Fifty countries on Monday signed the articles of agreement for the new China-led Asian Infrastructure Investment Bank, the first major global financial instrument independent from the Bretton Woods system. Seven remaining countries out of the 57 that have applied to be founding members, Denmark, Kuwait, Malaysia, Philippines, Holland, South Africa and Thailand, are awaiting domestic approval. “This will be a significant event. The constitution will lay a solid foundation for the establishment and operation of the AIIB,” said Chinese Finance Minister Lou Jiwei. 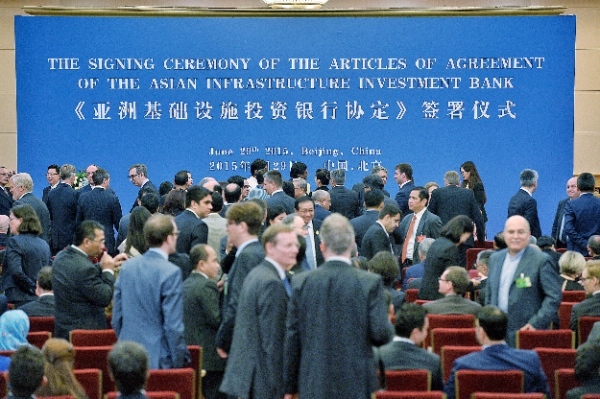 The AIIB will have an authorized capital of $100 billion, divided into shares that have a value of $100,000. BRICS members China, India and Russia are the three largest shareholders, with a voting share of 26.06 per cent, 7.5 per cent and 5.92 per cent, respectively. Following the signing of the bank’s charter, the agreement on the $100 billion AIIB will now have to be ratified by the parliaments of the founding members. Asian countries will contribute up to 75 per cent of the total capital and be allocated a share of the quota based on their economic size. Chinese Vice Finance Minister Shi Yaobin said China’s initial stake and voting share are “natural results” of current rules, and may be diluted as more members join. Australia was first to sign the agreement in the Great Hall of the People in Beijing on Monday, state media reports said. The Bank will base its headquarters in Beijing. The Chinese Finance Ministry said the new lender will start operations by the end of 2015 under two preconditions: At least 10 prospective members ratify the agreement, and the initial subscribed capital is no less than 50 per cent of the authorized capital. China scholar Asit Biswas at the Lee Kuan Yew School of Public Policy, Singapore, says Washington’s criticism of the China-led Bank is “childish”. “Some critics argue that the AIIB will reduce the environmental, social and procurement standards in a race to the bottom. This is a childish criticism, especially because China has invited other governments to help with funding and governance,” he writes. However, despite US pressures on its allies not to join the bank, Britain, France, Germany, Italy among others have signed on as founding members of the China-led Bank. Meanwhile, New Zealand and Australia have already announced that they will invest $87.27 million and $718 million respectively as paid-in capital to the AIIB. The new lender will finance infrastructure projects like the construction of roads, railways, and airports in the Asia-Pacific Region.